The Armstrong installation has completed the seventh growing season. It utilized 376,000 gallons US of landfill leachate on 250 trees in 2011. 26,000 gallons US of potable water including rain, is recorded over a 6 month period of 2011. Irrigation lowered the reservoir pond 60 centimeters, therefore creating storage. Rainfall at this site, over the course of a year will determine amounts of leachate recovered to the reservoir pond. Note: the understory is well weeded while leaves help defeat weeds and provide natural nutrient. Character irrigation works remain easily accessed. 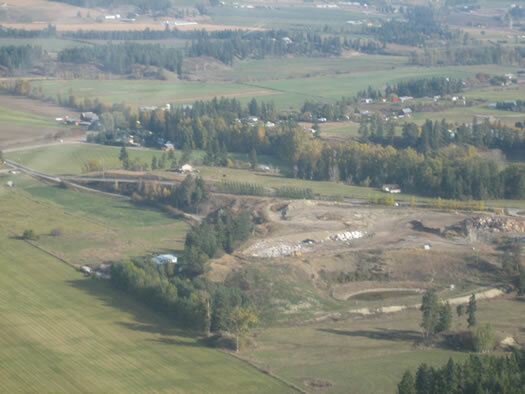 This is an aerial shot in October 2011 of North Okanagan Regional district landfill operation near Armstrong BC. A phytoremediation plantation in the foreground remedies well over one acre foot of effluent/leachate every year. The plantation in this case is not on the cap, but within the footprint of the over all operation. Note; the trees along the road act as a dust and visual screen. The project started in the spring of 2005, a deer fence was installed to protect the property. This enclosure contains 1.25 acres of land, where soil tests indicated the lack of nutrients. This land historically was productive farm land, but over years of neglect now contained discarded clay fill and weeds. This area also contained sections of partially buried woody root debris. The ground was ripped and cross ripped, debris removed, then breaking disked to prepare the soil. No brushing (herbicide) was applied. Planting stock was prepared earlier and stored in a refrigerated environment. The planting area was staked for tree positions to facilitate through movement of equipment. Planting time length of the magic sticks was 45 cm. They were planted approximately 25cm below ground level. The average height at the end of the season was 3 meters, with some marked variety performance differences. Planting was done in May after frost danger passed. A total of 5 varieties of hybrid poplar were used. Each tree was identified by a number to track the individual growth. 13 trees at random were chosen for study comparison. An irrigation system was designed, then installed to maximize the effective monitoring of product delivery. An underground header feeds the rows with individual emitters supplying each tree. This system is useable for either water or leachate. To ensure a total separation from potable water supply, a large tank was installed to provide the necessary stand alone fresh water irrigation, with a back flow prevention filling device. In spite of poor weather conditions the growth of the trees was immediate. Cool and wet weather conditions through July stunted the start up, leaving only 3 to 5 weeks of optimum sunny, dry conditions. Monitoring over the season showed an average growth of 50 mm per day, during optimum weather conditions. Additional nutrient was provided to the trees manually at specific intervals. Leachate was applied successfully late in the season. The trees showed a marked growth rate increase during this period based on variety. This project proved to be a success yielding a survival rate of 99.5%. Due to daily manual weed management, this labour intensive practice is necessary to eliminate growth competition during early development. Summer discharges of saline wastewater to the water tables are reduced. Nitrogen in the wastewater is beneficially reused to grow trees. Our projects further the understanding of how hybrid poplar clones and parental crosses respond to high salinity water. The aesthetics of the plantation of hybrid poplars far exceed those of the traditional seasonal storage of wastewater in a giant holding lagoons.